Mari Anne is listed in the #3 position in the "40 Most Inspirational C-Level Leaders in Sales Lead Management" in 2015 and is also listed in the "20 Women to Watch in Sales Lead Management" in 2016, 2015, 2014, 2013, 2012, and 2011. She was recently a speaker in featured sessions at Dreamforce on Social Selling and has been invited to speak three times recently in featured sessions. 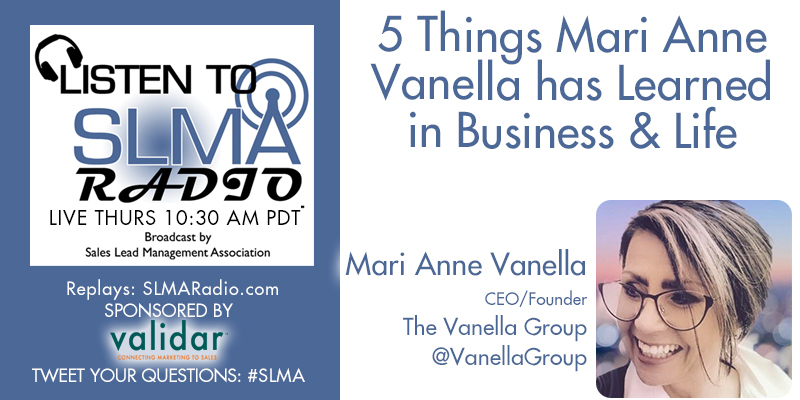 She has also been invited to represent the SMB CEO role at "LinkedIn Live" event which was co-sponsored by the regional Chamber of Commerce and focused on how SMB's can successfully leverage LinkedIn as The Vanella Group, Inc. has.